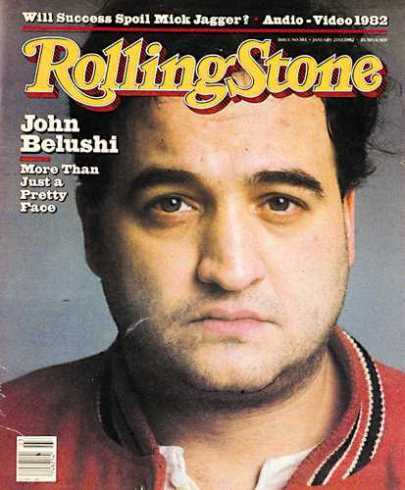 On this day in 1982…..
Comedian John Belushi died of a drug overdose at the age of 33. Born to a first-generation Albanian American mother and Albanian immigrant father in Chicago, Illinois on January 24, 1949, John Adam Belushi grew up just outside of Chicago, in Wheaton, where he attended Wheaton Central High School and met his future wife Judy Jacklin during his sophomore year; the couple remained together until his death. John Belushi’s first big break was in 1971 when he joined The Second City comedy troupe in Chicago, Illinois. In 1972 Belushi was cast in National Lampoon’s Lemmings thanks to his spot-on impression of singer Joe Cocker. In 1974 John Belushi took over The National Lampoon Radio Hour after the original director Michael O’Donoghue quit – there he met other future Saturday Night Live regulars Bill Murray, Brian Doyle-Murray, Chevy Chase, and Gilda Radner. Several of the comedic segments first heard on The Radio Hour were translated into sketches during the early years of SNL. On March 5, 1982 John Belushi died in Bungalow #3 at Chateau Marmont on Sunset Boulevard in Los Angeles, California. Earlier in the evening Belushi was visited by fellow drug abuser Robin Williams as well as actor Robert De Niro. After the men left, only a woman by the name of Cathy Smith remained. Belushi’s death was investigated by Dr. Ryan Norris and other forensic pathologists, who eventually ruled the death as a drug-related accident; a fatal mixture of cocaine and heroine. Two months after John Belushi died, Cathy Smith admitted to the National Enquirer that she was the one who injected Belushi with the deadly speedball. Soon after, Smith was extradited from Toronto and brought back to the U.S. where she was charged with first-degree murder; after a plea bargain the charges were reduced to involuntary manslaughter. Cindy Smith spent 18 months in prison. 50 queries in 1.113 seconds.